students Erin Rapoport and Edna Walker, 2001. 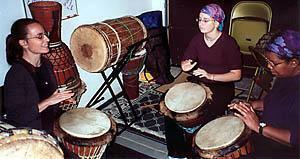 Learn to play African Drums with CDP! Ketu Oladuwa, Steve Foster and Robert Anderson. 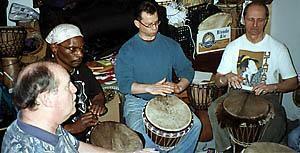 The Chicago Djembe Project's intensive West African Djembe and Dundun (bass drum) drumming workshops are for beginning and experienced students looking for authentic, professional instruction. Our classes encourage students to take the djembe seriously as a musical instrument and respect it as an expression of a sophisticated culture. Karen Shields and Amy Lusk, 2000. 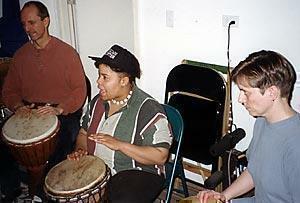 Woodshed students Helen Bond and Steve Foster (inside left/right) with CDP Instructors Lilian Friedberg and Jim Banks(outside left/right) performing in 2002.